Last week I turned the ripe old age of 26 and to commiserate celebrate I made my parents take me out for some finger lickin' good food. Last year I was in Berlin and the year previous a beach in Vietnam so being stuck in London this time round I wanted to go somewhere extra nice. Actually, who am I kidding, I always make my parents take me somewhere nice. Anyway, I digress. Ever since I went to Hong Kong a few years ago I've been obsessed with views, one type of view in particular, night time up a tall building to be exact. Now, London isn't a city know for it's abundance of skyscrapers, there are a few scattered about but its no New York or Dubai. Previous birthday have been spent at the Tate Modern restaurant and the Oxo Tower (both delicious) but neither are high enough in my opinion. I actually wanted to go to the Gherkin originally but I found out the restaurant is for private members or people who work there and sadly I am neither of those. Anyway, a few months ago Duck and Waffle opened on the 40th floor of the Heron Tower in the city and with it's trendy European menu I knew it was the place I wanted to be. But first things first, pre dinner drinks across the road at Vertigo 42. Now, this is a bar I've wanted to visit for a long time. Situated on the 42nd floor of Tower 42, Vertigo 42 (srsly) is a bar with unrivalled views, exquisite cocktails and a price list to make a lowly science gal like me weep. As far as I'm aware you have to book a table and don't be alarmed when they ask you to go through airport style security before entering the lift. It's small and full of your average city workers and despite the drab interior it really does offer something special. Every single table has a window seat and the service is impeccable so you really do get your moneys worth. I had a couple of lychee Bellinis which were super tasty and went splendidly with a bowl of waasabi peas to share. After drinks we walked a short 3 minute walk across the road and around the corner to Duck and Waffle. Now, if your not a fan of lifts beware. This place has a glorious glass elevator that shoots up to the restaurant in a matter of seconds, definitely a bit of a stomach in your mouth journey. I'm a big fan of cocktails but I was a little disappointed to see the menu only offer the rum, gin or whiskey variety (all of which I hate) but the waiter kindly offered to make me something 'fruity with vodka'. What I got was a delicious concoction of vodka, guava and fresh berries! Now on to the most important part, the food! The menu at Duck and Waffle is designed for sharing with small plates, big plates and even bigger plates, it's a bit like tapas, but not Spanish. We had a few small plates, a few big plates and a 'for the table' plate as well and by the end of the meal we were all satisfyingly full without being overly stuffed. The first thing to the table was the rabbit rillettes severed with sourdough, beer chutney and pistachio. I always feel a little guilty eating rabbit as I have a pet one but this was delicious. Next up was the mutton sliders (x2 portions - yes to burgers as I say) which I enjoyed but wouldn't rave about. As a bit of a burger expert I've had a lot nicer! The second round of food included BBQ spiced crispy pig ears (tasted liked crisps which isn't necessarily a bad thing) and foie gras all day breakfast. I'm not the biggest fan of foie gras to be honest, the ethics put me of as does the super rich taste but this was enjoyable. It was basically toast with foie gras, an egg, crispy bacon and black pudding. The third round was seafood orientated; delicious crab on toast and tasty mussels and clams. I love shellfish! The penultimate round was sublime, roast salt beef with a soft egg but it was the final round and the piece de resistance that did it for me, duck and waffle (x2 portions). If you can't tell this is waffle, crispy duck confit, duck egg and mustard maple syrup. I actually thought I wouldn't enjoy this mess dish that much but let me tell you, it was incredible! Yes, a heart attack on a plate but worth it, all the textures and sweet and savoury flavours were heaven. 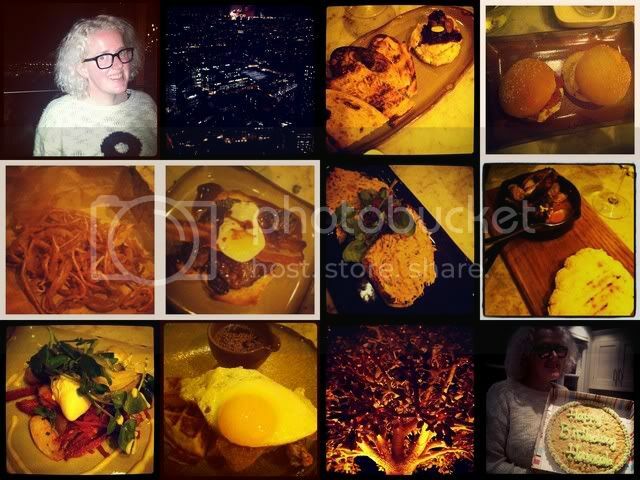 If I could recommend only one dish it would be the duck and waffle for sure. 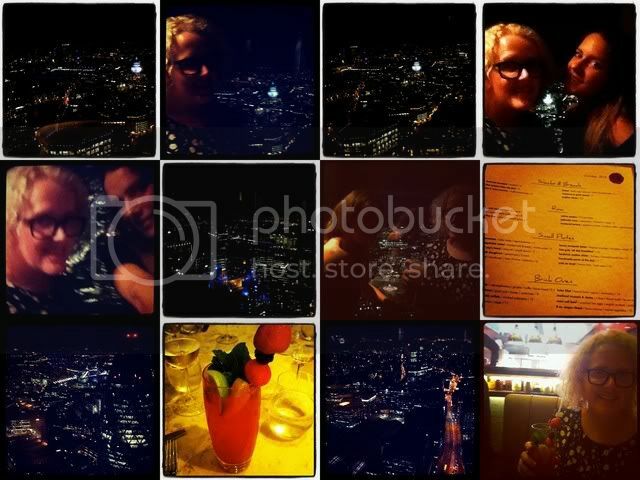 This restaurant really was fantastic, the service was a bit iffy in places but the food was glorious, the views of London are gorgeous, the decor is modern without being 'too trendy' and the atmosphere is fun. Duck and Waffle is a real unique experience and I would rush back in a second. After dinner we head downstairs to the newly opened Sushisamba, not for more food I add but for a drink on the balcony terrace and good vibes from the busy bar. I really do love this building! This sounds like you had an amazing birthday, I love the sound of all that food!